I am not a qualified scientist; however, the following short paper is mostly scientific and, I would say, highly accurate. One could call it an informal research report. The Cedar Nut Oil is discussed often as having health benefits, frequently used for treating digestive disorders in specific, as well as being useful topically. I believe the healing aspect of the oil is not due to the usually cited proteins and fatty acids, although the protein content and lack of sugars does make the nuts into a good staple food. To my understanding, the therapeutic effect comes from three factors: biophotons, or life-energy, ORMUS minerals, and polyunsaturated fatty acids. Polyunsaturated fatty acids, when taken internally, are difficult to digest for many people, especially those with compromised digestions. The result is that they adsorb toxins and carry them out of the system during voiding of the bowels. The highly geometrical structure of the polyunsaturated fatty acids, such as those in the cedar nut oil, hempseed oil, and flax oil allows for loose binding with many healthful items, such as polysaccharides, bioflavonoids, other phytochemicals, minerals and ORMUS minerals, and biophoton clusters. In the colon, these beneficial vitamins and chemicals will be exchanged for toxins, which will be carried out of the system with the unmetabolized fatty acids. Not metabolizing polyunsaturated fats is, for the most part, not an issue in itself, as the body only needs a small amount of polyunsaturated fats. Depending on one's biology, it may be easier for one to un-saturate dietary fats or to saturated dietary fats of the unsaturated type. In the former case, animal fats will be easier to digest; the latter situation is, I believe, uncommon; however, it can be done, and the systems of vegans will generally accommodate and up-regulate their metabolism of this type over time, as most plant fats are unsaturated. Of course, some unsaturated fatty acids are essential, and, for the most part, they are more easily obtained from grassfed animals, seafood, cod liver oil, or pastured egg yolks than from plant fats such as cedar nut oil. However, the cedar nut oil has other qualities to recommend it. ORMUS minerals were discovered in the 1980s as an entirely new class of elemental/chemical compounds which can be found in all living things. Because of difficulties in assaying materials for ORMUS content, science previously saw ORMUS showing up on their tests as carbon compounds, silicon, aluminum, calcium, or other elements; occasionally, a sample of material would give no coherent reading at all, and was therefore discarded without further investigation. ORMUS is frequently associated with highly evolved and complex polysaccharides and other phytochemicals, such as those in cedar nut oil. It is also conscious, and therefore responds strongly to the positive intentions of the workers making the oil. 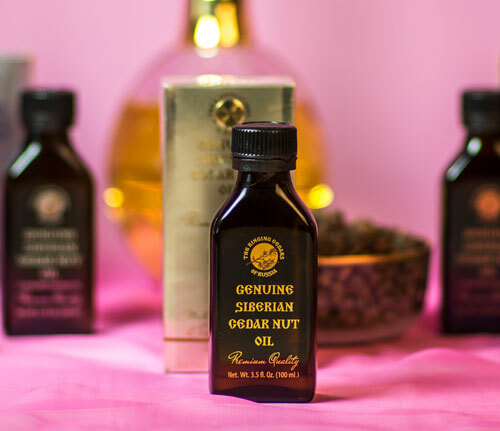 ORMUS is generally deficient in the modern diet, and so, to have a dietary source of ORMUS will help many people to reactivate their DNA and healing potential, meaning the ORMUS-rich cedar nut oil can help ameliorate many various health issues. Related to this topic, German researchers, led by Fritz Albert-Popp, have been doing investigational research in a new field of biophysics called biophotonics. They have found that certain frequencies of the electromagnetic spectrum are beneficial for preserving foods and that certain others speed up putrefaction. Thus, the common advice to keep oils out of direct sunlight is not adequate, as the oil will continually lose freshness unless it is exposed to the beneficial wavelengths while the harmful ones are kept away. This is possible through the use of a special type of packaging material. The take-home message is that the cedar trees selectively concentrate biophotons over the two-year ripening of the cedar nuts, and that eating the nuts in their fresh state in the Taiga will have a better effect than having them at any other time of less freshness afterwards. But, biophotons and ORMUS minerals, which are mutually associated with many of the same phytochemical/fatty acid structures, can re-migrate into the oil or the nuts given the proper conditions. In fact, it is through the medium of biophoton light energy and the ORMUS minerals' trans-dimensional channeling capability that communication and healing occurs; thus, prayers, enery work, and love energy can induce ORMUS and biophoton fields to once again enter the oil. These substances have no difficulty crossing the clear-glass barrier of the bottles. However, a different packaging material can hold these elements in by allowing the sun's beneficial rays to enter while exclluding the harmful frequencies, just as the cedar trees do while they are still actively informing their seed-crop progeny. I believe these explanations can be used to account for most all healing and energizing effects physical as well as emotional from the cedar nut oil. When discussing the nuts, the protein and fatty acid components will also play a large role, as well as the fact that being in a less-refined and fresher state their content of biophoton ripeness will be greater. However, because they are a more cohesive substance, one's digestive secretions will have to be stronger to properly digest the nuts and unlock the ORMUS and other nutrients from their carbon-matrix of polyunsaturated fatty acids and other molecules. In this case, the vegans among us will have an advantage, in general, though, truly the greatest health and strongest digestion results from a diet low in sugars and high in uncooked animal, dairy, or seafood products; this will supply the necessary fat-soluble vitamins, cholesterol, and minerals necessary to make highly potent digestive enzymes and metabolic enzymes to heal one's body. One should keep in mind the freshness factor at all times, and, for more information on the packaging technology, you may contact me. It can be applied with great effectiveness to raw milk, cod liver oil, honey, or virtually any natural product to enhance its taste and nutrition and to preserve these qualities over time, even all winter: imagine raw fresh tomatoes, fresh raspberries, unwilted baby greens, in February, uncanned, never heated, fresh and tasty four months after harvest!